I have recreated this clafoutis recipe from June D’arville. I had never made any French food before. Since I found June recipe; I decided to try out. I wanted to have something of me in this recipe that I have created. So I added blueberries and use two types of milk. 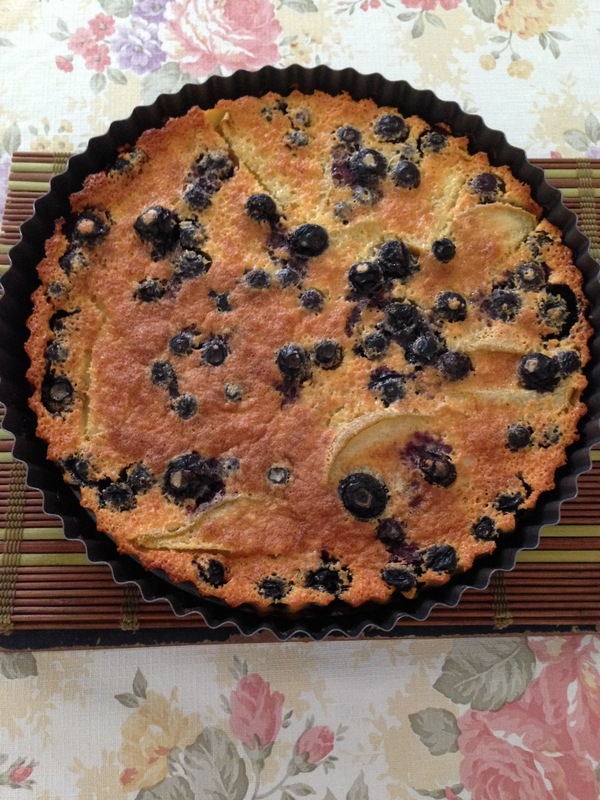 I noticed that my clafoutis is not as beautiful as June; its quite thin compared to the picture June had displayed in her website. Anyway, I am glad that I try out. Next time, it will be more better. Enjoyed my first French dessert. Hopefully I can learn more French cooking. Preheat the oven to 180°C. Pour 2 tablespoons of cold water in a tiny cup and add the saffron threads. Slice the pears 1/2 mm in lengthwise. Remove the seeds in the middle. Place the pear slices in a medium pan and both milk. Place the pan over medium heat and gently poach the pears for about 10 minutes. Turn them about halfway through cooking time. Once this is done, remove the pears and place them in 24 cm tart tin which you glazed with the unsalted butter first. Let the pears cool. Strain the warm milk in measuring cup. To make the clafoutis you only need 160 ml. Break the eggs and transfer them to a large mixing bowl. Pour in the caster sugar. Beat the eggs and sugar until pale and foamy. Pour in (160 ml) of lukewarm milk you kept aside. Stir well again. Sift with the sifted pastry flour and a little pinch of salt. Also pour in the soaked saffron now. Whisk into a runny batter. Let it rest for 10 minutes to make the saffron develop fully. Then pour the saffron batter carefully in the tart tin with the poached pears. Now gently drop in the blueberries around. Bake the clafoutis in the hot over for 40 to 50 minutes. The top should be lightly golden and the batter should be fully set in the center. Note: clafoutis will puff up a little while baking then reduce while cooling down. Remove the clafoutis from the hot oven and let it cool at room temperature. Then sprinkle with icing sugar or caster sugar and serve lukewarm (optional).